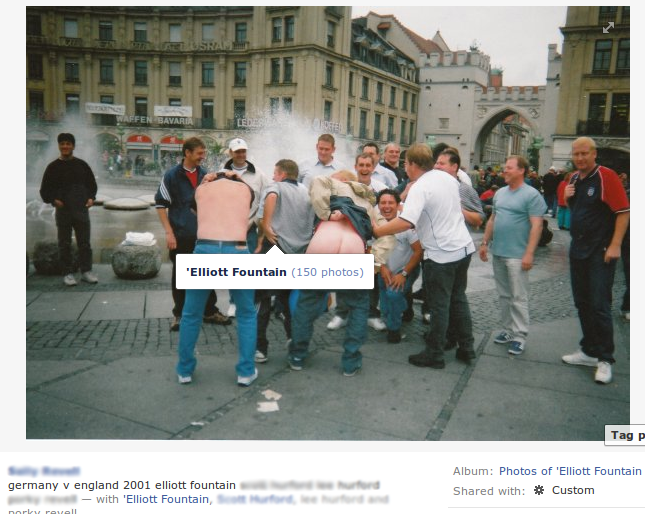 Leicester Casuals love defending England from mythical horrors. So much so that they have to invent enemies to give their handful of followers something to do. Yesterday they started the frothfest with rumours that Muslims were attacking an 88 year old war veteran who was selling poppies in Leicester town centre. 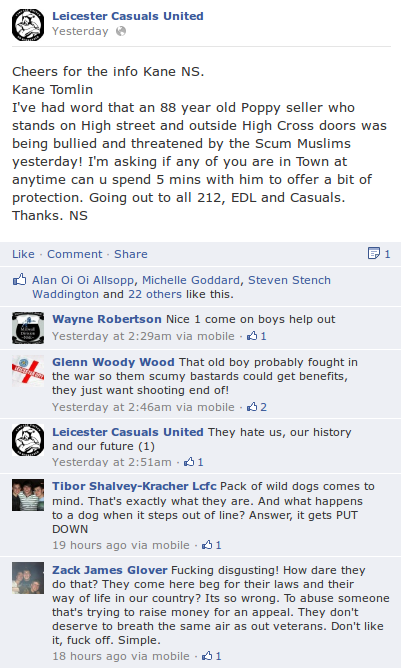 It didn’t take long for far right followers to start champing at the bit, saying the “scummy bastards… want shooting end of!” Leicester Casuals added a melodramatic dimension to this (non-existent) monster: “They hate us, our history and our future”. 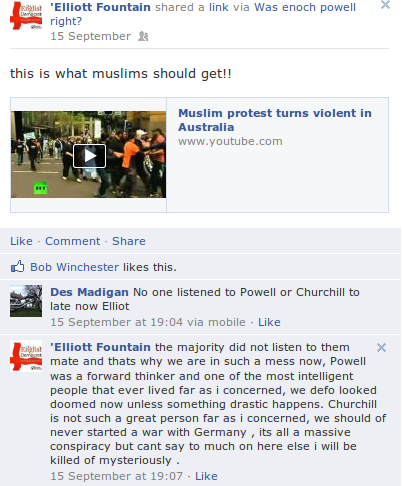 Other followers compared the made-up gang of Muslims to a “Pack of wild dogs” and suggested that they should be “PUT DOWN”. “They don’t deserve to breath the same air as our veterans” added another. 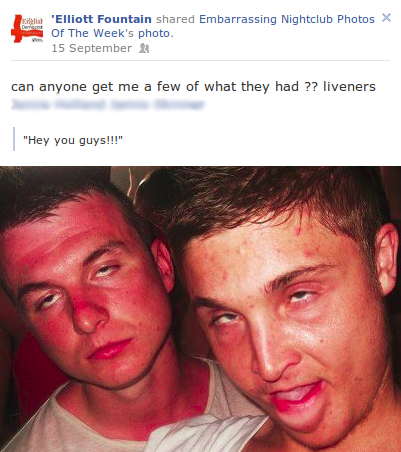 The problem is that it was all in their minds. There was no smoking muslamic raygun. 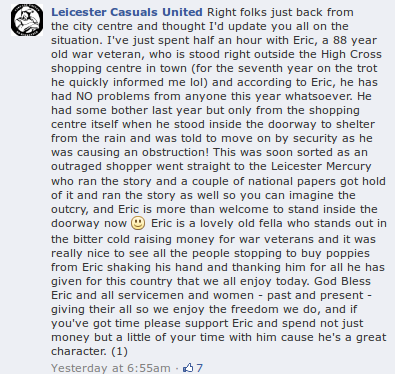 Leicester Casuals later admitted that veteran, Eric, “has had NO problems from anyone this year whatsoever” and that the only previous problems he’d had were with shopping centre staff. 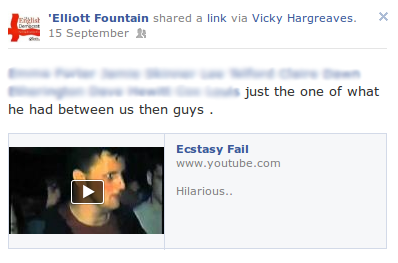 Did they apologise for spreading such inflammatory and divisive rumours and take down their original post? Of course not. And out of interest, the comments about dogs and not breathing the same air as veterans were added after the truth had been established. 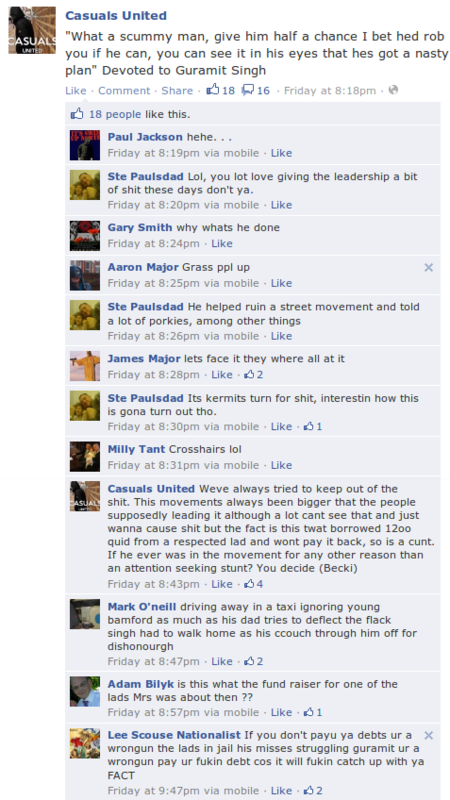 Leicester Casuals are paranoid, untrustworthy and are stoking community tensions out of ignorance. Poor old Amit Singh! 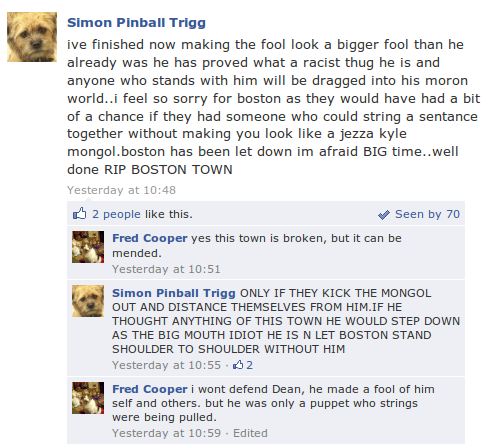 He ostracised himself from the Sikh community by joining up with a gang of racists, then the Luton mafia decided he had too many ideas and kicked him out of the EDL leadership and now Casuals United are publicly naming and shaming him as a wrong ‘un who doesn’t pay his debts. At least he’s got other people’s money to keep him happy! 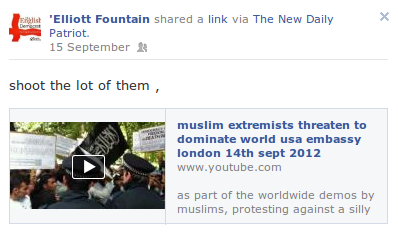 Gedling’s most famous islamophobe has fallen on hard times. Have fun in the wilderness Uncle Tom! 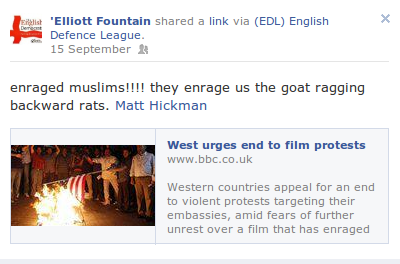 The arch-muppets at Nottingham EDL have managed to get caught inciting a riot on Twitter. “The way OB scum are treating us they will have a riot on their hands in #Walthamstow next Sat and it won’t be our fault” they tweeted yesterday. 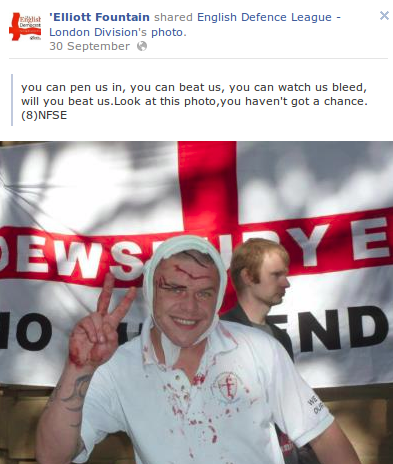 In what may or may not be a coincidence, the Met have since applied for a banning order on the EDL marching at the weekend. Well done lads!